Fold your cleaning cloth in quarters so you can rotate the cloth to a clean dry surface after you clean each area. Start with the handle and tank. Spray your glass or multi-surface cleaner on the surface and wipe with your dry cloth, cleaning the surface but being sure the surface isn’t too wet since you want to be able to polish the surface dry. Do not clean the lid, seat or any other area of the toilet before cleaning the handle and tank or you will be spreading around germs from the dirtier areas to the areas that typically aren’t as dirty. Move to the lid and seat. 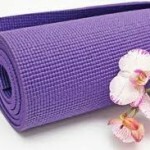 Apply your cleaner and use a clean, dry surface of your cloth to clean and polish dry. The seat is likely the most dirty surface and often you will have to use more cleaner and/or more cleaning cloths than with other parts of the toilet. On to the toilet bowl. Sprinkle cleanser in the bowl, making sure you cover the entire bowl, sides of the bowl included. Dip your brush in the toilet water to wet it then sprinkle cleanser on it as well. Scrub in a circular motion starting at the top of the bowl and working your way down to the bottom of the water in the bowl. 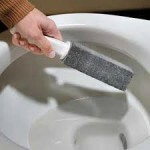 Once done, shake the excess water off of your brush and flush the toilet afterwards to rid yourself of germs that could crawl back up onto the toilet. Remember to scrub under the rim of the bowl. 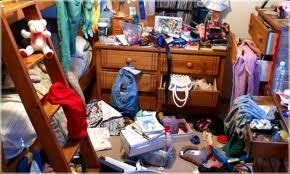 Many people miss this area and as a result, it becomes an area for unpleasant guests to thrive. Also, scrubbing from top to bottom of the bowl is a more effective way of cleaning because the toilet water becomes cloudy and dirt-filled if you start at the bottom. Contaminated water is not a good way to remove germs. Finish by applying cleaner to the outside of the bowl and clean the front and sides of the bowl using the same technique. Using a clean, dry cloth, you can touch up and polish dry any area of the toilet where there is excess cleaner which should leave you with a sparkling fresh toilet. 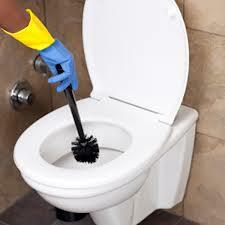 Following the above steps on how to clean a toilet will keep it fresh and clean! When thinking about how to clean fruits and vegetables, buying a bottle of cleaner that you see in the produce area of the grocery store may be an option. However, you can easily make your own mixture for a fraction of the cost. Fruits and vegetables have either edible outsides or not. The benefit of eating the skins of apples, potatoes, zucchini and cucumber, for example, are that you get fiber in your diet. 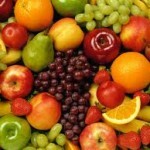 However, the downfall is some fruits and vegetables skins may have been exposed to pesticides. Even if you wash the outside of the fruit or vegetable reallly well, you may not be able to completely get rid of the residual pesiticides. Not good! This is why it is recommended that you buy organic fruits and vegetables if you plan to eat the skin. It is not as big a deal when you are not eating the outsides like on a banana or an onion. Mix the ingredients in the spray bottle. The liquid will appear a bit foamy. To clean fruits and vegetables, simply spray the liquid on the food. Let sit for 5 minutes. Rinse under cold, running water, using a soft scrub brush on the food if desired. And that’s how to clean fruits and vegetables. 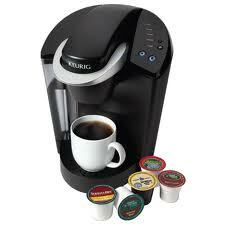 Learning how to clean a keurig will prolong the life of the brewer and ensure it is operating properly. The external components of a Keurig can be cleaned with a soapy, damp, non-abrasive cloth. Do not immerse the brewer in water or any other liquid. The K-Cup holder, funnel, drip plate and drip tray are all dishwasher safe. 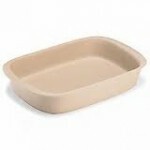 The removable water reservoir and lid are NOT dishwasher safe so you should wash them by hand with warm, soapy water and a non-abrasive cloth. In order to ensure you don’t contaminate your water supply, ensure that no cleaning solutions or cleaners are in or near the water reservoir. Be sure to perform a cleansing brew to ensure that the K-Cup holder is clean and clear of residue after brewing hot cocoa, Cafe Escapes or Perfect Iced Tea K-Cup varieties. Remove the K-Cup assembly. The K-Cup holder can be washed in the dishwasher. The funnel is also dishwasher safe. To clean the exit needle of coffee grounds or cocoa mix, insert a paper clip into the tube and move it around to loosen the clog and remove debris. Every 3-6 months, you should descale your Keurig. Although scale is harmless, it can hinder the operation of the brewer. Please see your Keurig instructions applicable to your particular unit. Learning how to clean a Keurig brewing systems will allow you years of optimal use. 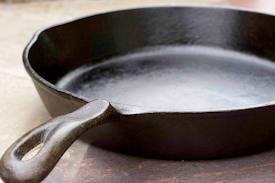 There are do’s and don’ts when it comes to how to clean a cast iron skillet. It is important that you pay attention to these simple instructions so as not to damage your cast iron skillet. If you follow these steps on how to clean a cast iron skillet, you will be able to keep your pan clean, rust-free and well-seasoned. It is best to clean your cast iron skillet when after use, when it is still a bit warm. Put the skillet in clean, warm water. 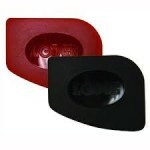 Use a small plastic scraper, stiff brush or sponge to remove stuck on food. You can also make a paste of salt and water, then scrub the paste on the bottom of the pan to remove stuck on food. If you have stubborn food residue that won’t come off the skillet, try boiling some water in the pan to loosen the food. Once the skillet is clean, towel dry the inside. 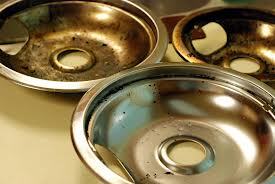 You can also put the skillet on a stove burner on low, but do not leave the pan unattended. After the skillet is dry, pour a small amount of vegetable oil or melted shortening in the skillet and rub it around with a clean paper towel. This is to re-season the pan. If you have rust in your cast iron skillet, you can use a bit of steel wool, but you will have to re-season the pan afterwards. You can also clean the rust by rubbing the cut side of a potato and a sprinkle of baking soda on the bottom of the skillet. Rinse well with warm water the re-season the pan. 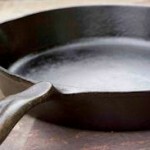 Do wash your cast iron skillet after use, when it is still warm. Do store your skillet in a dry place. Do re-season your cast iron skillet as needed. Don’t put your cast iron skillet in the dishwasher. 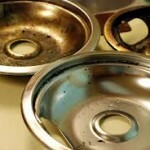 Don’t use steel wool as this may strip the seasoning from the skillet. Now that you know how to clean a cast iron skillet, you can treat yours properly to ensure cooking (and eating) enjoyment for many years! 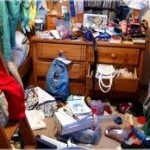 Have fun cleaning up the clutter! 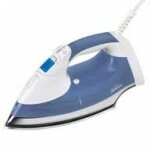 Keeping your iron clean is important so you don’t transfer dirt or gunk from the hot iron to the material you are ironing. To keep your iron in good working condition, you should read the manufacturer’s manual that came with your iron. Be sure to start with a cool iron. Trying to clean a warm or hot iron is not only dangerous, but your cleaning efforts would be ineffective on the hot surface. If the surface of the iron plate is oily, use a clean cloth dampened with ammonia or window cleaner then use another clean cloth dampened with water to wipe off the iron plate. 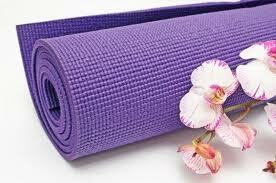 A clean cloth dampened with vinegar can also be used instead of window cleaner. If the iron plate has wax-like dirt on it, you can turn the iron into a hot settling and use a scrunched up newspaper to wipe the iron plate. Let the iron cool then wipe it with a clean cloth dampened with water. To clean in the holes on the iron plate, use a cotton swab dampened with ammonia or window cleaner then wipe holes again with cotton swabs dampened with water. Do not use any sharp objects to scrape or clean the holes in the iron plate. The surface may get scratched. To clean the water reservoir in your iron, fill it with one part vinegar and one part water. Turn on the iron to get it hot. Let it steam for a few minutes, and use the spray feature. Turn the iron off and let it cool. Empty any remaining liquid from the reservoir. Add water to the reservoir and turn the iron back on. Let it steam for a few minutes and use the spray feature. Turn off the iron and let it cool. Empty the reservoir. You can repeat the water steps if you want to be completely sure there is no vinegar left in your iron. To clean the rest of your iron, use a clean cloth dampened with ammonia, window cleaner, general purpose cleaner or vinegar. Wipe all surfaces. And that’s how to clean an iron! The best way to clean thermal paste off a CPU is to use isopropyl alcohol (as high a percent as possible like 90%) and a coffee filter. Using something like Q-tips or tissues can leave behind small hairs or fibers. 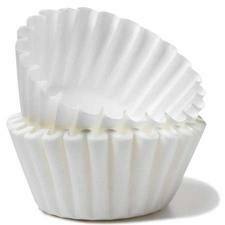 Coffee filters leave nothing behind. Get the coffee filter damp with solution and wipe the thermal paste. Alcohol prep pads (for site injections) can be used as well. They are convenient and perfectly sized. If you are having a tough time cleaning the thermal paste from a CPU, try using fingernail polish remover and a Q-tip. The fingernail polish remover should be the basic acetone kind with no additives or fragrances. Once you have cleaned the thermal paste off a CPU, wipe the area with the isopropyl alcohol and coffee filter, or with the alcohol prep pad. Dry the area with a quick spray of canned air which will dry any dampness and blow away any fibers that may be left from the Q-tip. And that is how to clean thermal paste off a CPU.